Quintillus, AD 270. AE Antoninianus. 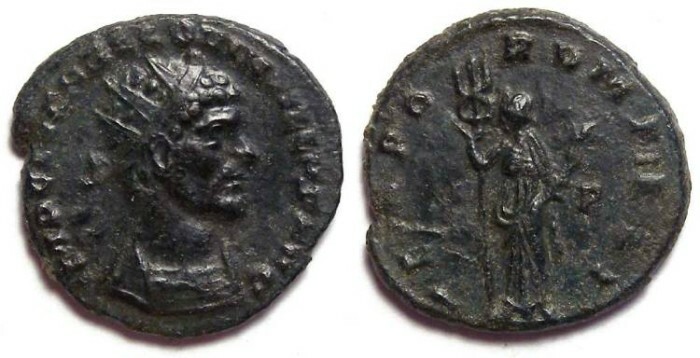 Denomination : Bronze Antoninianus. Mint : Siscia. Reference : Sear-11452, RIC V, pt 1 #74-c. Cohen-65. Size : 19.1 x 19.5 mm. Weight : 3.13 grams. Grade : XF, some flan flaws, and some weakness. Very dark, nearly black, patina. Obverse : Radiate bust of Quintillus right, with IMP C M AVR CL QVINTILLUS AVG around. Reverse : Felicitas standing left holding a caduceus and cornucopiae, with TEMPORVM FELI around, with the officina mark P in the right field.